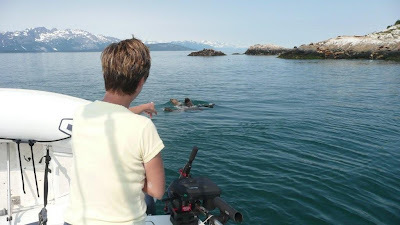 33' to Alaska: Friday, July 10, Elfin Cove – A Cool Little Drinking Village With A Big Fishing Problem! 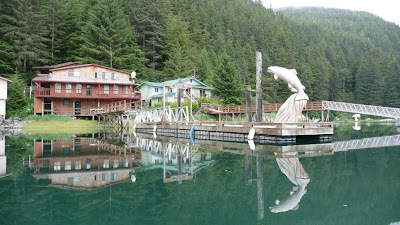 Friday, July 10, Elfin Cove – A Cool Little Drinking Village With A Big Fishing Problem! Yesterday, I left off when Connor was getting bites. Sure ‘nuf…he got an 18 pounder. Good work, Connor! So, our freezer and coolers are getting filled up! 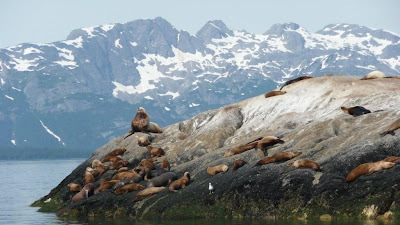 We explored Dundas Inlet and picked up an anchorage for the night right beside a colony of sea otters and their babies. It was a bit breezy and the clouds and fog are setting back in…nutz! This morning, we set sail for Elfin Cove, a short 13 mile run through the fog. We are out of food, water, and need to get out and stretch a bit. Along the way, we came across a colony of sea lions. We just sat there and watched them play “King Of The Mountain.” They are so cool the way they fight and wrestle and play with each other. They are noisy and stinky. We got lots of great video. Elfin Cove is cool little drinking village with a big fishing problem. It’s a boardwalk community with 10 year round residents. We ate burgers at the little café which had 4 tables. The little community is mostly made up of fisherman and resorts. Everyone was so friendly and gave us lots of fishing tips and navigation advice. We even got invited to a salmon barbecue tonight, where we got to know some of the locals. Val did some shopping in the tiny little store but found enough food to tide us over to Sitka. Connor met a little buddy on the docks and played with him all day. Cody got his fix “texting” his friends. I got caught up on some phone calls, but no internet, and still got to go for a nice kayak ride around town. We all had a really good day today. It was good to be off the boat for most of the day. We were debating about taking the west coast back south or turning back and taking the inside passage back down. Talking to the locals gave me the courage to make the attempt tomorrow. So, here we are again, nervous, scared, and excited all at the same time. The weather looks favorable other than fog, but the wind usually doesn’t blow when it’s foggy.